This September, Banana Republic will introduce two more fragrances in their Discover Collection (see Alabaster, Jade, Rosewood, Slate & Black Walnut): Malachite and Cordovan. In keeping with the tradition of the Discover Collection, Banana Republic named these fragrances after luxurious natural materials that represent the ultimate in femininity and masculinity, respectively, and instantly bring to mind a unique color and texture. Malachite is the new entry for women, and is designed to evoke "radiant grace". The dark green bottle is shaped like an egg, and the notes for the floral scent include water hyacinth, pepper, green mango, imperial peony, winter pear, rose carnation, sandalwood, vanilla and musk. 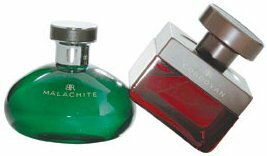 Banana Republic Malachite will be available in 20, 50 and 100 ml. Cordovan is for men, and the modern woody fragrance is meant to call up "rugged masculinity". The red bottle was inspired by an old-fashioned inkwell, and the notes include leafy green fig, bergamot, raw nutmeg, white juniper berries, iced lavender, vintage leather, woody orris and vetiver root. Banana Republic Cordovan will be available in 50 and 100 ml.